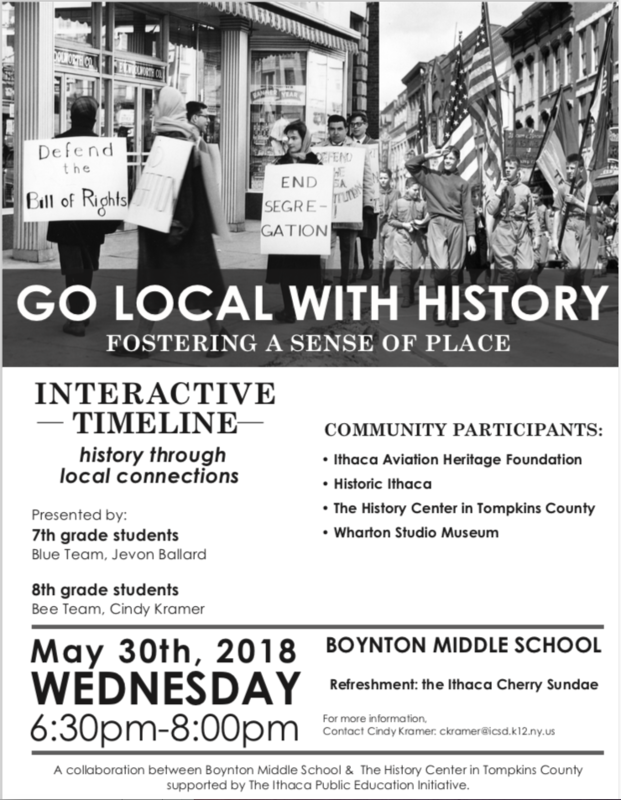 Project: In 2017, the Tompkins County bicentennial provided an opportunity for over 175 seventh and eighth graders at Boynton Middle School to collaborate with The History Center on the “Go Local with History” project. The purpose was to deepen student understanding of local history, offer them an opportunity to contribute to community projects, allow for choice and voice in the research and development of a topic and provide a venue to share their new knowledge and passion about local history with the Boynton school community. In 2017, students created and submitted personal maps to the Tompkins County bicentennial project, “My Tompkins.” Due to an enthusiastic response to learning about local history from students and family members, the “Go Local with History Project” continued in 2018. In both years, the culminating project highlighted student research on a local historical event or topic connected to the seventh or eighth grade United States history curriculum. Working as historians, students built knowledge then worked to creatively represent their learning in various interactive and engaging formats. Some examples of their culminating projects included an art exhibit of drawings of local buildings, scale models, interactive games, and a digital interactive map of Taughannock Falls State Park. In 2018, 8th grade students also created a descriptive digital map of their special outdoor places. In both years, the final event received a packed audience of family and community members who celebrated this learning and forged a rich vision of how all of us can participate in civic life. This work was supported by Teacher Grants from the Ithaca Public Education Initiative (IPEI). Standards: Many New York State Social Studies, as well as Reading, Writing, Speaking and Listening Standards. Experts/Local Connections: The History Center in Tompkins County, The Wharton Studio Museum, Historic Ithaca, and multiple local historians. Fieldwork: Conducted at The History Center in Tompkins County.